Fall is here and in West Texas I can feel the cool weather approaching and the change of frontal passage from warm to cold, and cold to warm. Fall in West Texas is my favorite because you get to experience Fall before it turns too cold. As a Kansas boy we went from summer to winter most years. It seemed as though Fall skipped us. I have not been able to do much observing do to family and business, but I hope to get out more. Before observing this evening, a big buck decided to venture near and watch what I was doing. I don't think he cared about me when he had females to look at. I snapped this photo and I thought it was a great picture. Been a while since I did anything to my blog. Standby and I'll download some new info and pictures. A galaxy in the constellation Pegasus. There are a series of smaller galaxies near this as seen closely in the picture. 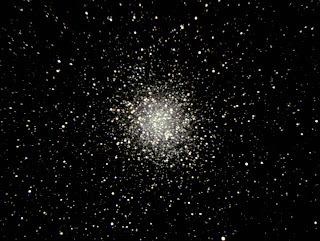 A Globular Cluster in the constellation Sagittarius. 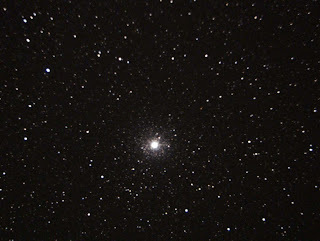 About 87,000 light years from Earth, M54 is about 150 light years across. A face-on spiral galaxy about 27 million light years from Earth. It is in the constellation Ursa Major (Big Dipper). It is nearly twice as big as our own Milky Way Galaxy. A giant interstellar cloud in the constellation Sagittarius. Estimated to be 4,100 light years away. Leaving for Fort Davis on July 16 and I'm hoping for clear skies. I'm hoping to get some great images so I can post them on the blog. Haven't done much lately since I've been busy this summer doing things with the family. Been working like crazy with the Midland Planning and Zoning to work out some wordage on the lighting ordinance. Things are starting to go really well and hopefully I will be on the commission starting in August. I don't really know the advantage for this other than I get to voice my opinion on the type of outdoor lighting being installed on new construction. Me. Need I say more? I've been doing astrophotography for about four years now. Long way from being a professional. My wife thinks I am a nerd, but I never considered myself so. My images are nothing compared to some of the great ameteur imagers out there. I have come a long way, however. I've been looking through telescopes for about 11 years now. 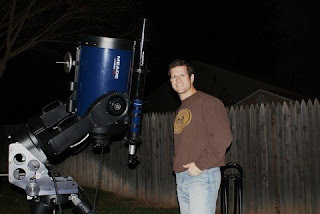 My equipment includes a 12" LX200GPS from Meade. It is a go-to scope which uses GPS satellites to track images. I also have a small refractor riding on top of the main scope to serve as my autoguider, and finally a Meade DSI (Deep Sky Imager) CCD camera. 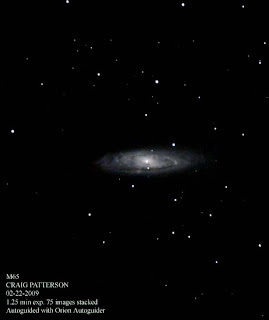 When I do widefield images, I use the Canon EOS Xsi. 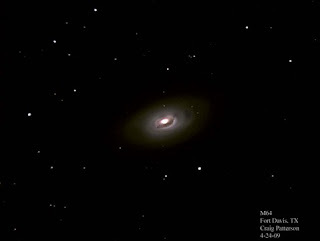 M64, the Black Eye Galaxy has a dark band of absorbing dust in front of the bright nucleus giving the name "Black Eye." It's about 19 million light years away. 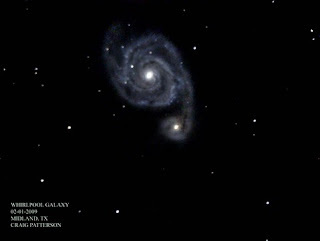 M51 or what is called the Whirlpool Galaxy. 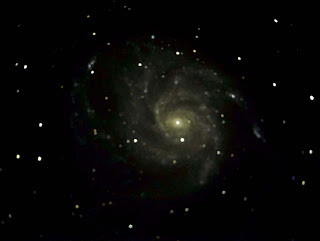 It's a spiral galaxy located about 31 million light years away in the constellation Canes Venatici. You are seeing this object not as it exists today, but as it existed 31 million years ago. Here you can see the sky glow from a small town in western Kansas. This is Hays, KS. Around 30,000 people live there with smaller cities around it. Hays is the largest city in Western Kansas and as it gets bigger, so does the sky glow. Skies are sure beautiful in Kansas, however, there is no legislation reducing light pollution other than certain state parks. As you can see in the picture, the sky glow cuts out part of the dark sky. "The sky is on fire." This is the sort of things that are hurting astronomers. 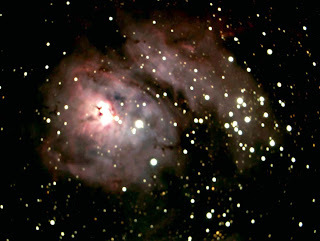 M22 in Sagittarius. Taken in Fort Davis, TX under brilliant dark skies. I've been hitting the subject of light pollution really hard in the last two months and I'm suprised about all I have learned and tried to teach. Light pollution is the easiest form of pollution to get rid of. Just turn out a light and the problem is solved right? This is true if you want to live in darkness. I don't want to live in darkness, however I have installed interesting light fixtures on my house to set an example of what good lighting is. What is good lighting? Good lighting is lighting that doesn't spread out so my neighbors can see it. It is light that never goes into the sky to illuminate clouds and the bellies of birds. If we can all get educated on proper outdoor lighting, then the effects of light pollution won't be seen as much. There will still be a little sky glow from reflected light that hits the ground, but it won't be as bad as a light shining straight up to brighten the sky. Poorly designed lighting is the root cause of light pollution and the ignorance of "More is better." More is not better. This is a myth. If a full cut-off fixture was installed, then most of the light will be shining downward where it belongs and not to the side or up. You will find that installing a full cut-off fixture will provide downward light where it is needed and you can use a light bulb that uses less wattage because the full cut-off fixture allows all the light to shine on the subject. A full cut-off fixture will eliminate glare and wasteful light. Light that shines to the side is called "light trespass" and this affects our vision during the night. It also causes unwanted glare. We as Americans waste approximately one-billion dollars a year to illuminate clouds. Clouds should be dark at night and not glowing orange right? It's a win-win situation for everyone. Astronomers get their stars back, penny pinchers save money, and others eliminate wasteful carbon emissions. Also, more lighting doesn't cut down on crime. For example, my neighbor has her lights running from dusk to dawn. However, the other night, her vehicle was broken in to. Did these lights help or not? The answer is no. Criminals love lights. They need lights to do their criminal work. Also, overlit areas create glare where a criminal can hide behind the glare. You won't see the criminal because you will be shielding your eyes from the glare. Ever tried driving down the road after work going west? It's hard on the eyes without a sun visor to get rid of the glare isn't it. You may not see the car in front of you if the sun is low on the horizon. Think about it. Hello. I am Craig Patterson. I've always been interested in the natural world, especially when it comes to the sky. Our Milky Way galaxy stretches from horizon to horizon and galaxies and other stars are amazingly exciting to view on a clear dark evening. You could say it is therapy for me to look through my telescope and view these incredible works of art that nature has created.